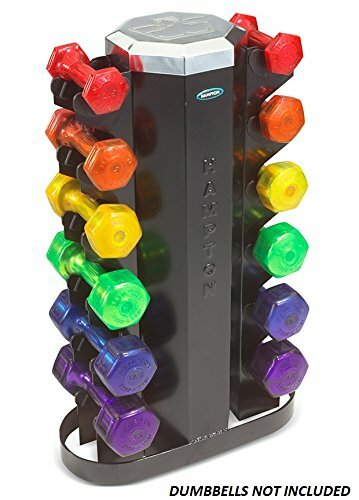 Hampton Jelly-Bell-Neoprene-Vinyl Dumbbell Rack - What a great dumbbell rack by Hampton. Because of its narrow dumbbell slots, it holds any six pairs of Hampton Jelly-Bells, Neo-Hex and even Vinyl dumbbells up to 15 lbs. The MV-JB-6 is a functional dumbbell rack with a relatively simple design and an attractive look suitable for any home gym or training studio. It is built from heavy 12-gauge steel with a base and centralized loading tower that remains secure and stable no matter the dumbbell set configuration. Plastic lined cradles are included to help preserve the vinyl, neoprene, or urethane dumbbell coatings. Gloss black finish with chrome cap. Dumbbells as shown in manufacturer stock photo are for demonstration purposes only and are NOT included. Space saving design with two-sided vertical racking. 12-gauge steel construction. Holds 6 pairs of vinyl, neoprene, or urethane aerobic dumbbells up to 15 lbs. Cradles lined with heavy plastic to protect dumbbell handle finish. Dimensions: 19" L x 8.5" W x 32" H. Weight: 32 lbs.